Our industries provide sustainable access to high quality medicines for all European patients, for generic, biosimilar and value added medicines. Every single day, our industries increase access to the best standard of care in all therapeutic areas. Between 2005 and 2015, for the same budget, generic competition allowed twice as many patients access to medicines for key therapeutic areas such as diabetes, depression, epilepsy, cardiovascular disease, hypertension, asthma/COPD or gastro-intestinal disease. Biosimilar medicines have also increased access to treatment with complex biological medicines. For instance, the introduction of biosimilar filgrastim, used to treat the consequences of chemotherapy, increased patient access by 44% across Europe. Not only could more patients get access to this treatment, physicians were also able to use the medicine earlier in the treatment cycle, to the benefit of the patient. Why should you care about medicines policy, and what needs to be done? Because of ageing populations, budgetary constraints and rising healthcare costs – not helped by inefficiency and waste in the system – European healthcare faces unprecedented and growing pressures; pressures that are already threatening the viability of the European healthcare system. Something must be done to safeguard European citizens’ access to healthcare. We launched the Access to Medicines project aiming to make the case for ensuring the sustainability of European healthcare systems, and a common-sense approach to make use of the opportunity that generic, biosimilar and value added medicines do and can bring. The European medicines industry has extensive manufacturing capabilities in producing high quality generic, biosimilar and value added medicines throughout Europe. With over 350 manufacturing plants and R&D centres, companies represented within Medicines for Europe provide over 160,000 skilled, high value direct jobs in Europe, and more than half a million indirect jobs. Medicines for Europe is committed to supporting industrial policy initiatives aimed at strengthening the European industrial base, increasing investments in R&D for generic, biosimilar and value added medicines, boosting EU competitiveness, and taking up the opportunities which are opening up in Europe and worldwide. A manufacturing waiver under the Supplementary Protection Certificate (SPC) in the EU serves this purpose. The SPC manufacturing waiver is essential for the EU. Its introduction would create 25.000 additional jobs, €3.1 billion saving in EU pharmaceutical spending and net sales of the EU based pharmaceutical industry of €9.5 billion. 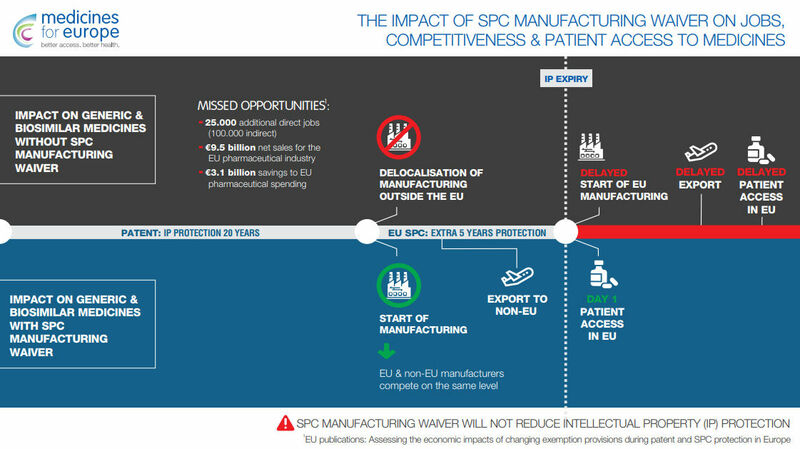 The fast implementation of the SPC manufacturing waiver is key to avoid further technology transfer of pharmaceutical production outside Europe and boost R&D and manufacturing investment in Europe, without shifting the balance between originator and competitive pharmaceutical sectors. In Europe the pharmaceutical legislation and existing guidelines regulate the entire lifecycle of medicines, from their development over their approval and entry on the market to their availability for the patient. Both Generic Medicines and Biosimilar medicines are important parts of the EU pharmaceutical legislation. Medicines for Europe and its member companies and associations support and promote a European regulatory framework that ensures patient access to high quality, safe and effective medicines and that focusses on the highest-priority issues that make the real difference for patients. During the development of generic, biosimilar or value added medicines, clinical trials have to be performed to establish an equivalence with the originator product. Medicines for Europe and its members support a strong EU Good Clinical Practices (GCP) system as a cornerstone for ensuring the quality of the clinical data supporting marketing authorisations of all medicines. In view of the globalisation of the industry and to avoid of unethical repetition of studies for the purpose of marketing authorisations in several regions, Medicines for Europe calls for a high-standard global regulatory convergence in the field of clinical trials, enabling the single global development of generic, value added or biosimilar medicines. Before a medicinal product is allowed access to the market it needs to be registered and obtain a marketing authorisation which needs to be updated by variations throughout the lifecycle of the product. In the light of the importance of an efficient regulatory system in providing greater and timely access to high quality medicines for patients across Europe, Medicines for Europe has published the Regulatory Efficiency Report which proposed several solutions to remove unnecessary duplications, reduce administrative burdens and promote the effective use of IT systems to support regulatory processes. Special emphasis is placed on the optimisation of the variation system, which is particularly burdensome for authorities and industry. Once the product is on the market, the quality, safety and efficacy needs to be assured. In this regard, Medicines for Europe encourages the production of pharmaceutical ingredients and medicinal products to the highest standards of excellence. All the individual companies represented by Medicines for Europe abide by the rules of Good Manufacturing Practice (GMP) in approved and regularly inspected production plants. Moreover they are committed to maintaining a stringent overview of their suppliers and outsourced activities and to set up resilient supply chains to guarantee a sustained access to medicines for patients. All the members of Medicines for Europe have a pharmacovigilance system in place to monitor the safety of their products on the market. Patient health and safety is of the utmost importance to Medicines for Europe. Consequently a Medicines for Europe management team member’s sole focus is to streamline the organisation’s efforts and to support, cooperate and (co)lead on various initiatives that are fighting counterfeit medicines. ASOP (Alliance for Safe online pharmacies): The uniting purpose of the Alliance for Safe Online Pharmacies (ASOP) is to protect patient safety globally and ensure patient access to safe and legitimate online pharmacies in accordance with applicable laws. Fakeshare: Fakeshare is a European project dealing with cooperation and intelligence against the online selling of falsified or illegal medicines through non authorized e-pharmacies or other resellers. 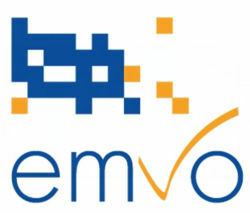 EMVO (European Medicines Verification Organisation): The European Medicines Verification System (EMVS) has been designed with the sole purpose of providing an interoperable pan-European system for the purpose of medicines verification in accordance with the Falsified Medicines Directive (FMD) and its supplementing Delegated Regulation (DR). Fight the Fakes: Fight the Fakes is a campaign that aims to raise awareness about the dangers of fake medicines. The campaign gives a voice to those who have been personally impacted and shares the stories of those working to put a stop to this threat to public health. It seeks to build a global movement of organizations and individuals who will shine light on the negative impact that fake medicines have on people around the globe and to reduce the negative consequences on individuals worldwide. Medicines for Europe is proud to announce its partnership in the Fight the Fakes campaign. The infiltration of falsified medicines in the European supply chain is a real concern and, in order to counter this threat, the Directive 2011/62/EU obliges manufacturers to set up and pay for a system that enables the verification of the authenticity of medicines in the EU. Its DR, published on 9 February 2016, describes the rules to establish this European verification system: all Member States must have their national verification system up and running by 9 February 2019 (except Belgium, Italy and Greece: 9 February 2025). Following the FMD and its DR, EMVO – established by 5 EU stakeholders (EFPIA, Medicines for Europe, EAEPC, PGEU and GIRP), designed a system which ensures such an ‘end-point-verification’ system. The European pharmaceutical industry, represented by the Association of the European Self-Medication Industry (AESGP), the European Federation of Pharmaceutical Industries (EFPIA), and Medicines for Europe, recognises and understands the concerns raised by stakeholders as regards the presence of pharmaceuticals in the environment (PiE). For this reason, we have come together to develop the Eco-Pharmaco-Stewardship (EPS) concept, a proposal that strives to protect patients’ access to medicines while appropriately considering environmental aspects. Medicines play a critical role in ensuring a high level of public health, and we believe that political debates on PiE should not overlook the value that medicines bring to European citizens. As pharmaceuticals can enter the environment at all stages of the product’s life cycle, reducing pharmaceuticals in the environment will be the result of cooperation between the public and private sector and the consumers they serve. Therefore, all actions should strike the optimal balance between economic costs and the benefit of medicines to public health. This principle is very much part of the EPS. Pillar 1 – Encouraging further research to assess the impact of PiE: The pharmaceutical industry is actively engaged in scientific research projects (independently and in partnership) aimed at filling the priority knowledge gaps for “legacy” APIs, medicinal products approved before 2006, in order to support informed science-based policy-making on PiE. The industry has initiated the iPiE project (Intelligence-led Assessment of Pharmaceuticals in the Environment) in a public-private partnership with the European Commission under the umbrella of the Innovative Medicines Initiative (IMI). This multi-stakeholder project aims at developing models for prioritising legacy products for more in-depth environmental assessment. In addition to prioritising legacy APIs, the models may also be applicable to new molecules in the early R&D stages. iPIE is expected to be completed by end of 2018. Pillar 2 – Manage pharmaceutical site effluent effectively: Whilst the overall contribution of pharmaceutical manufacturing to PiE is relatively low compared with that from other sources, the pharmaceutical industry has developed and is continuously implementing initiatives which minimise API discharges from manufacturing operations through the exchange of good practices. Coupled with this, industry is proposing a ‘maturity ladder’ aimed at helping companies to gauge their performance and take improvement measures where needed on a risk-based approach. 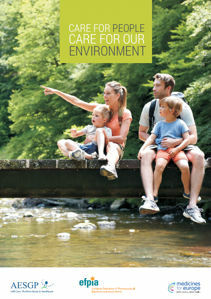 Pillar 3 – Monitor environmental impact through extended Environmental Risk Assessment (eERA): In the context of EPS, the pharmaceutical industry believes that the ERA should be reviewed and, if necessary, adapted throughout the product’s life cycle, for example to refine usage figures and investigate effect concerns identified post-approval. Should the ERA outcome change, environmental risk management measures could be put in place or adjusted. In addition to these specific areas for action, the pharmaceutical industry stands ready to support European and Member States’ communication activities, as well as awareness raising campaigns towards patients on the appropriate use, storage and disposal of medicines. In particular, healthcare stakeholders jointly developed medsdisposal.eu, an online (social media) communication campaign aimed at raising public awareness on the existing collection and disposal schemes already in place in Member States, emphasizing the fact that it is everyone’s responsibility and it is easier than one may think. Antibiotic medicines are a cornerstone of modern medical practice. Not only do they treat a wide range of infectious diseases, but they also guarantee patient safety during medical procedures, such as transplants, in hospitals. Whilst antimicrobial resistance (AMR) is a natural phenomenon, it has increased dramatically over the last 20 years, making it a serious threat to public health, thus jeopardizing healthcare providers’ ability to manage life-threatening infections. As the main provider of antibiotic medicines, the generic medicines industry wishes to put forward a number of policy recommendations to counter the spread of antimicrobial resistance whilst ensuring patients’ access to life-saving antibiotics. Tackling the threat of AMR requires a comprehensive and collaborative response involving key healthcare stakeholders: government, industry, healthcare providers and patients. Whilst there is increasing data available about the spread of antimicrobial resistance in Europe, we believe that specific figures on the use of antibiotics in human medicine would allow us to better identify and address the current trends and challenges of antibiotic use over time based on consistent and standardized criteria. As the spread of AMR is driven by the inappropriate and/or overuse of antibiotic medicine, it is crucial that patients and all healthcare professionals (including dentists and nurses) use antibiotics appropriately. For instance, patients should be full informed on the importance of finishing a treatment course, even when their condition seems to improve. Lack of adherence to treatment and stopping the therapy too early is one of the causes of antimicrobial resistance. This educational element should be a regular part of medical consultation with doctors and regularly confirmed by pharmacists when medicines are dispensed in pharmacies. The sustainability of antibiotic medicine supply is also a critical issue for the EU. Despite the increase of AMR, antibiotic medicines remain indispensable to perform a number of medical procedures or treat major infectious diseases. It is therefore crucial to ensure a continuous supply of high-quality antibiotics in the EU and to avoid shortages that can put patients’ lives at risk. The traditional business model does not encourage the development of new generation antibiotics due to the low prices, and the fact that any new antibiotic coming onto the market that would come on the market would only be used in a restrictive manner (i.e. as a last resort when other antibiotics prove ineffective). 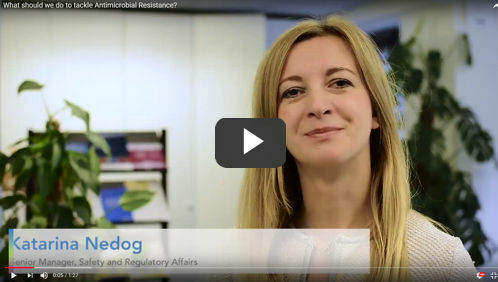 In order to incentivize antibacterial R&D and ensure that initial R&D investments are recouped, a new model of research and incentives is needed, which needs to be un-linked from the volume of sales in order to contain any further spread of AMR. It is difficult to assess the risk of AMR associated with the environment. The link between the effluent from pharmaceutical manufacturing facilities and the spread of antimicrobial resistance should be investigated and substantiated by the relevant environmental authorities. Although there should not be any leftovers and excess prescribing when it comes to antibiotic treatments, the fact that unused antibiotics are not being properly disposed of needs to be tackled. Medicines for Europe, together with industry colleagues, is working on the take back of unused medicines (including antibiotics) to pharmacies to ensure they are properly disposed of: see medsdisposal campaign. Generic medicines have proven to be pivotal in increasing patient access and preventing medicine shortages through increased choice and availability of treatments. However, generic medicines policies have recently focused exclusively on reducing prices thereby increasing the risk of medicine shortages. The sustainability of healthcare budgets in Europe has been intensely pressured by multiple factors, such as a growing and ageing population, an increased disease burden, the introduction and increased cost of new innovative medicines,,. To overcome these challenges, several national authorities have adopted austerity measures and applied short-term cost-containment measures to pharmaceuticals, including to generic medicines despite their low cost (around 4% of total healthcare expenditure in Europe) and their relevance for care (62% of medicines dispensed today in Europe are generic medicines). Short-term cost-cutting measures, such as ad-hoc price cuts, external reference pricing, payback, tendering, etc. have driven the prices of some off-patent medicines to unsustainably low levels. This causes manufacturers of generic medicines to withdraw from the market, resulting in the increased risk of medicine shortages,,. The evidence now shows that many national markets across Europe are relying on too few suppliers for essential life-saving medicines in both the hospital and ambulatory sectors. Tackling medicines shortages in a multi-source context, requires an approach that addresses both the root causes of medicines shortages and mitigates medicine shortages once they occur. Addressing the economic causes of shortages to ensure market predictability and competition, improving regulatory efficiency, improving transparency in supply chain and a proper and controlled communication are important measures to tackle medicine shortages. Please find more information on Medicines for Europe key recommendations to tackle medicines shortages here and the Economist Intelligence Unit report on medicine shortages here. OECD, Fiscal Sustainability of Health Systems: Bridging Health and Finance Perspectives. 2015. SFK (Foundation for Pharmaceutical Statistics), Pharmaceutisch Weekblad. 2014. APM Health 2015. Available at: http://www.apmhealtheurope.com/home.php. QuintilesIMS Health. An International Comparison of Best Practice Approaches to Drug Shortages. 2015.